The most potent and the most delicious salt and vinegar crisps ever sold in newsagents. Even thinking about the intense vinegar flavour of Banshee Bones is enough to make your eyes and mouth water. No salt and vinegar crisp comes close to Banshee Bones. Sometimes they would even hurt your mouth, but in the best way possible. Nowhere else will you find vinegar that powerful. RIP little ones. These came in a bunch of mad flavours like ‘Whipple Scrumptious Fudgemallow Delight’ and despite being some of the tastiest chocolate bars ever made, they were discontinued a year after their release. Last seen past their expiration date in 2009 in a chemist over the side of Omni Shopping Centre that nobody ever goes to. All of the remaining bars were purchased by a DailyEdge.ie writer who foolishly ate them all within two weeks and did not sell them to a museum. Menthol 7up. Not something you would ever think about drinking on a regular basis but definitely a hit with kids. Ahhh. This bar just brings you straight back to the Celtic Tiger. There’s a Facebook group that has been active since 2008 where 364 people are begging Cadbury’s to bring this bar back because they’re having dreams about it several years later. Remember the good old days when Snow Flakes were sacred bars that nobody would dare to speak ill of? Bring back the days when Snow Flakes were just simple chocolate bars and not a stale insult used by people who have a little strop every time they’re called out for being racist. When The Goblet of Fire came out in cinemas, pound shops across the nation were full of Harry Potter Dragon Eggs that came in various flavours. The inside was a very delicious jelly/truffle kind of thing and there’s really been no product like it since 2005. Somebody fix this and bring back these chocolate eggs. There’s never going to be a discontinued snack list that doesn’t include dream bars. Cadbury’s advertising campaigns are always like “look how much milk we put in our chocolate!”, but to be honest, it will never be enough milk. Not until we have bars that contain the exact amount of milk that Dream bars did. In other words, make Dream bars again. They’re still available in New Zealand and Australia which is probably why they’re such popular spots for Irish emigrants. 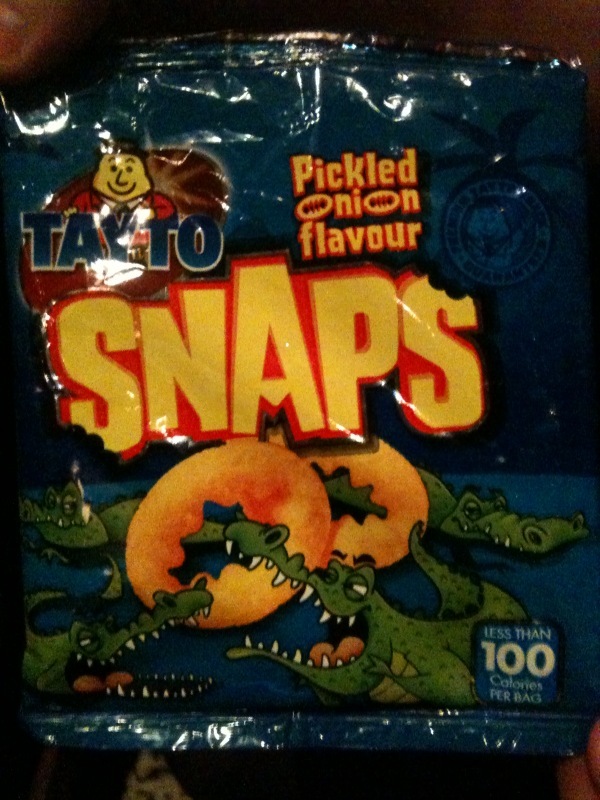 Possibly the last truly cheap crisps on the market, these picked onion crisps were very addictive. In 2007, they were the Freddos of crisps. Only 25c a packet, it was the snack you bought when you needed change for the bus on the way home from school and wanted something more substantial than a Freddo. In the years following, the price slowly climbed up to 45c before they disappeared from the shelves of newsagents at some point after 2011. HB have been toying with our hearts for years about whether or not they’ll ever bring back Fat Frogs. In 2014 they said that they wouldn’t rule out bringing them back, but to date, we’ve seen no such plan in motion. The people have spoken. The ball is in your court HB. This is the company that brought foot ice creams back for Christ’s sake. They won’t confirm or deny whether they’ll ever bring them back, which makes things much harder. Just say yes or no so we can move on with our lives. We need closure. These were one of those novelty sweets like Big Baby Pops or Brain Lickers that you rarely got to enjoy in the company of your parents, who thought they were stupid and pointless. It either took a trip out with a grandparent or a holiday to Spain for you to come into possession of these sugary frozen pellets. You could never get them all out of the tub, but there was still something very cool about them. The ads shown on TV for it were really, really weird in hindsight. Has there ever been a more sickening on screen kiss than the one between this man and a woman he found in a freezer? What the hell kind of party is this? Flavour-wise, these are far superior to Mighty Munch. 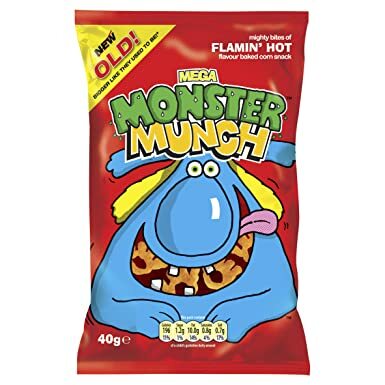 Yet Mighty Munch get pride of place on the shelves of newsagents across the country while Monster Munch are relegated back to multipacks on the shelves of obscure supermarkets that are out of reach of the majority of the population. They’re still out there, but you’ve really got to look hard for them. You can almost feel the heartburn just from looking at the packaging. Long Walnut Whips basically. But dearly missed by many. HB brought these back for an 80th birthday celebration, but they left just as quickly as they came. Aldi’s ice cream brand Gianni’s have their own take on it, but sometimes you just need a single one from a coffin freezer in an Ice Cream Man’s van. These were more fun to play with than to eat. Excellent treat to shut your kids up for a while. Hard to believe that these came out 18 years ago. Remember Rowntrees encouraged kids to pick up strange colourful bugs from cobwebs and eat them? These jellies really were so delicious though. Yes it was very similar to a Kinder Bueno. No that does not mean it’s OK that it’s no longer on sale. It was so much chunkier than a Kinder Bueno. Somehow, while only half the size of a Kinder Bueno, it was equally as satisfying. A bar that nobody will forget any time soon. The ice cream of your Celtic Tiger summer holidays. What more could you want than a whipped Cornetto? There’s absolutely no good reason why these shouldn’t still exist. Cheap enough, easy to make and the thing has wheels so you can take it anywhere. Please HB. Forget the Fat Frogs. You can keep them locked up away from the public for whatever reason. Aldi will make their own version of them eventually. Bring these back instead. You don’t know what you’ve got ’til it’s gone. These were so good that people are passive aggressively threatening to eat them eight years later if Mars don’t bring them back. Absolutely worth chancing it. Even if they weren’t nice, it’d help you get some closure because it would ruin your last impression of them. This and basically every chewy bar that ever existed, Wham, Black Jacks, Fruit Salads etc. They’re still out there but since the law started regulating the ingredients that are allowed go into sweets, these bars have suffered greatly both taste and texture-wise and aren’t even worth the damage they cause your insides and teeth anymore. These were discontinued in 2006, but eleven years later, there are people who still think about them regularly. Cadbury Graveyard was a campaign in 2015 that let people choose between bringing back Fuse bars or Cadbury’s Marble. Fuse won, but the bars were only distributed to a select group of randomly chosen voters. They’re currently still produced in India, so if you know anyone going over that way, get them to send some home. This was a bar of everybody’s favourite type of sweet from Christmas tins. The caramel one with the hazelnut is always the first to disappear from the box, regardless of whether it’s Quality Street, Roses or whatever else you have. Yes they have an ice cream version of it, but that’s not the same. People want their Nuts About Caramel bars back. Email “21 discontinued snacks that we really need back on the shelves”. Feedback on “21 discontinued snacks that we really need back on the shelves”.